• Edgar G. Ulmer: The Man Off-Screen - this archival documentary focuses on the life and legacy of director Edgar G. Ulmer. Included in it are clips from interviews with Roger Corman, Joe Dante, Peter Bogdanovich, Wim Wenders, John Landis, Ann Savage, and film historians Michael Omasta and Christian Cargnelli, amongst others. The documentary was produced in 2004. In English and German, with English subtitles where necessary. (76 min, 1080i). • Noah Isenberg - in this new video interview, Noah Isenberg, author of the British Film Institute's monograph on Detour and Edgar G. Ulmer: A Filmmaker at the Margins, discusses Detour and the life and career of its creator. The interview was conducted exclusively for Criterion in New York in November 2018. In English, not subtitled. (22 min, 1080p). • Restoring Detour - in this outstanding new program, restorers Mike Pogorzelski and Heather Linville discuss some of the complex challenges that they were presented with over the years while trying to reconstruct and restore Detour. The program was produced in 2018. (11 min, 1080p). 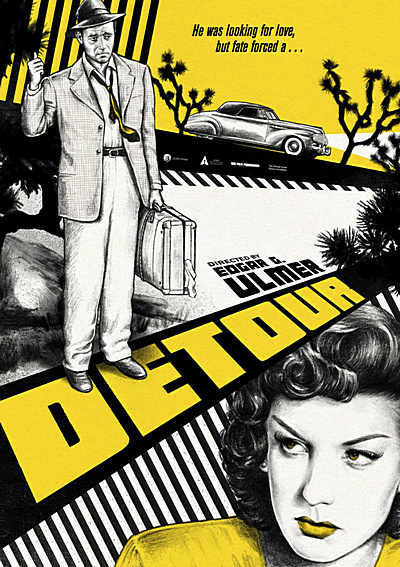 • Restoration Trailer - original trailer for the new 4K restoration of Detour. In English, not subtitled. (2 min, 1080p). Hope you upload the DVD for this set, as the film was edited by Criterion in both formats. It would be highgly appreciated! I will do it soon. Unfortunately now ausfile has problems with file uploading. Thank you very much. No hurries.